My car bounced into a pothole as I pulled off the paved road and up to an old villa nestled in a traditional neighborhood. From the outside it was difficult to tell that I was nearing a museum instead of a home. Inside the villa waited The Centre of Omani Dress, which is part of a larger effort to preserve the heritage of the nation and maintain local knowledge. Inside the villa volunteers preserve pieces donated by local families. Surprisingly, the volunteers at the museum on this particular day were all Western expat woman, instead of locals. We had entered into a small foyer converted to a museum shop and our tour began immediately. As we turned the corner and entered the first room I was so excited I didn’t know which way to look. 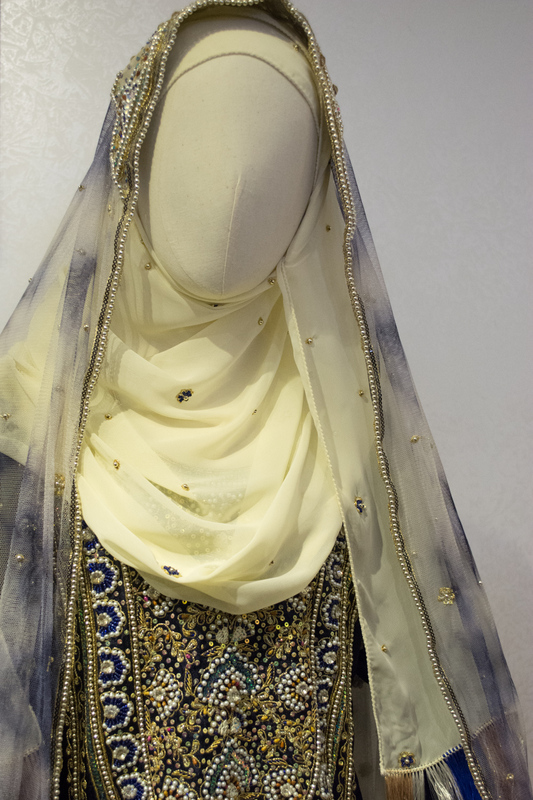 Beautiful dresses, face burqas, and jewelry surrounded the room and lay inside a glass case in the center. The guide began her story and I was quickly overwhelmed by all of the details she had to offer. I was fascinated and vigorously jotted notes in my tiny notebook. As she spoke I found myself drifting off to a fantasy-land trying to imagine the people that wore the clothing I admired. To my right were face veils or burqas. In Oman these veils are worn for modesty or protection from the sun. According to our guide choosing to wear a burqa is often compared to the Western choice to wear makeup. In Western society we wear makeup because we want to fit in with the acceptable norms of our community and wearing a burqa is often the same. I had previously assumed that the style of burqa belonged to a tribe or region. However, we learned that the design of the burqa actually varies by social group instead of region. To my left and lining the walls were variations on traditional female dress. Typically, the attire is varied by geographic region instead of social group. My favorite was the Shakia style dress. Shakia clothing is brightly colored, patterned and embroidered. Women wear a fine black netting to cover their attire instead of the more commonly seen solid black abaya. Interestingly, this netting was worn throughout history, but eventually was switched to the more solid black seen in modern abayas. It remained this was for about ten years, but because it was heavier and snagged easily they eventually returned to the netting. There is a rumor that this is also preferred because it allows others to see the colors and embroidery of the material underneath. Some of the clothing styles are woven with silver or gold in the thread. Along the wall opposite of where I stood there was a beautiful white embroidered outfit. We were told that when His Magesty Sultan Qaboos came to power he choose attire to represent both men and women as the Omani National Dress. There are specific details required in each piece to indicate that it is Omani National Dress. I couldn't keep up with all of these details in my notebook. Perhaps, I shall write to the museum for a reminder. As I explored the room I found a small inlet with details of perfumes and cosmetics. I hope you've had a chance to read my post about eyeliner, which was found in this section. We were promised a chance to try on the enormous silver jewelry at the end of the tour and we turned to continue our adventure. We headed upstairs to see menswear, which will be posted next week on Omani Dress - Part II.